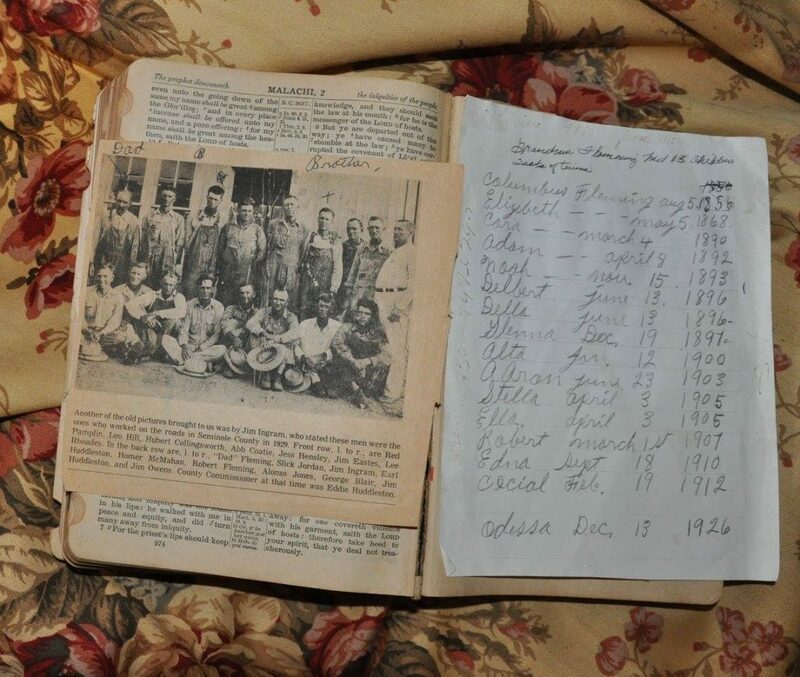 My great-granny’s family Bible is old — really old. Somehow it has survived and found its way to my mother. For many families their Bible was where treasures were kept. My mother discovered this while carefully turning the faded fragile pages that date back to the 1800’s. In the pages of that Bible was a handwritten note. My mother recognized her own granny’s handwriting in pencil of all her children that were born and their birthdates. Now that might not sound like anything remarkable but my great-granny had 15 children! The first name on the handwritten list was that of my great-granddaddy, Columbus who was born in 1856. That’s one hundred years before I was born. Tucked between the pages were newspaper clippings and recipes. A ration book page was also tucked in for a sack of flour plus a coupon for sending off for patterns to use with the flour sack fabric. Many of my momma’s childhood dresses were made from flour sacks. Granny’s Bible – Elizabeth Fleming. How long do you think it will be when no one will have handwritten letters and notes from family members long gone? Will people start saving their e-mails from loved ones instead of those precious handwritten letters and notes? Many schools are no longer teaching the students how to write in cursive. Of course, they are taught how to print by high school, but many students rarely pick up a pencil or a pen unless it’s to do their math. What Handwritten Notes or Letters Have You Saved? His brother also gave me a beautiful hair clip with his handwritten note. It said, “Thank you for always being there for me. I appreciate how much you have done for me. Thank you for always loving me unconditionally.” No present on earth could have topped these two sweet notes. I’ll never lose them because I will also treasure them away in my own family Bible. I do a lot of writing. Besides these little articles I write for our small town newspaper. The computer makes it possible for me to work from home and that’s okay for work stuff, but the next time I go to the store I will pick up some pretty stationary. It’s time I sent a few treasures along. Perhaps somebody will tuck them into their own family Bible.